Age is not a barrier: You are never too old to learn golf and it doesn’t matter what shape or size you are either. Golfers, even professional golfers come in ever shape and size imaginable. You’ll live longer: Really they do, 5 years on average according to a Swedish study. You’ll Stay Healthier: Golf help keeps you physically active and, if you walk, a round of golf sure helps you keep the weight off with an average 1500 calories burn in 18 holes. Golf Keeps You Mentally Active: Golf is not just a physical game but a mental one as well. It calls for strategy, creativity and problem-solving, all of which help keep your brain active, one of the key ingredients in fighting off the aging process. Great Way to Bridge the Generation Gap: You can play with your son or daughter, grandkids or whomever you meet on the first tee. 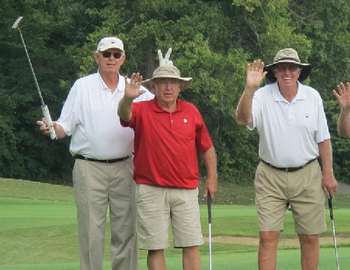 Golfers don’t care how young or old you are just that you enjoy the game! Improves Your Social Life: Golf on and off the course is a very social game. It’s a great way to make new friends or start a new relationship quickly and easily without any awkwardness! The Enjoyment of Communing With Nature. The birds, the bees, the flowers and the breeze. The views, the wildlife and the smell of fresh cut grass, just a few of the simple pleasures you will enjoy each and every time you play. The New Ending Challenge of the Game: With golf, every day is a fresh start on your never-ending challenge to shoot a lower score, par a specific hole or hit a certain type of shot well. Great value recreational: Golf is really a great value when compared to many other activities. The camaraderie of the 19th hole. There you can set the world’s problems to right and complain about the younger generation over your favorite beverage.